Call it a power app for busy Mac users. Daylite Touch from Marketcircle is an add-on for the company’s full-featured Daylite ( ) business organization tool. Using this mobile companion to Daylite, you can enter contact information, tasks, business objectives, and sales leads into the app, and any deletions, additions, or modifications are reflected when you sync back to the desktop version. 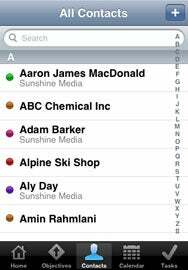 In Control of Contacts: As an add-on to the Daylite desktop application, Daylite Touch not only puts your contacts on your iPhone or iPod touch but also lets you associate them with tasks and objectives. If you use Daylite on the Mac, Daylite Touch is a must-have for your mobile device. In fact, the iPhone app is so rich and useful, it makes a compelling argument for jumping on the Daylite bandwagon, operating your business with a customer relationship management tool made specifically for Mac users. Daylite Touch gets most of its power by connecting to a server you run on a Mac and access over Wi-Fi or the Web. (In fact, Marketcircle stresses that the app is not designed for standalone use.) At its core, the app is a contact manager—or, in business parlance, a tool for customer relationship management (CRM). Installing Daylite Touch takes a few seconds, but configuring the server that runs on your Mac is more time-consuming. You have to install Daylite Server 3.9, configure it, and set up the database for Touch access. Once installed, you connect to the server using a simple login screen. For Web access, you need a static IP address – or, you can use a service such as No-IP.com. After all that, I had no trouble getting the server to work with Daylite Touch. When you add data to the server or from the Touch app, everything syncs automatically. There’s even a nifty “shake to sync” option to force a manual sync—say, right before you are ready to turn off your iPhone for the day. This shake is more like a rattle—it won’t work if you just shake gently. Of course, the real power of Daylite Touch—and the associated server and desktop program—is in linking all of these items. A task can be linked to a contact, for example. Say you want to make sure a new sales proposal is delivered to Bob Smith of Smith Construction. You can link that task, and even edit all sub-tasks en masse. Daylite Touch keeps track of these associations and rolls them up nicely in the home screen with a daily digest. My testing of the iPhone app found a few minor problems. Daylite Touch loads slowly—searching for the server takes times, and adding data is not fast either. For Mac users who prefer small apps that each perform a function (say, a contact manager and a to-do list), Touch forces you into an all-or-nothing model. In my initial tests, I also had a minor issue syncing over Wi-Fi with an older Mac mini because of an SSL encryption bug; Marketcircle reports that the Daylite 3.9.2 update resolved the problem. Based on feedback at Daylite Touch’s App Store page, some users are also taking issue with the app’s price. While Daylite Touch is a free download, that includes only sample data. To make it work with your own Daylite information, Marketcircle charges $50 per device per year. Some users will undoubtedly find that a steep price to pay, even as the company argues that the fee covers the development costs of a multi-user companion app with over-the-air sync. Others will find the cost perfectly reasonable given the capabilities Daylite Touch puts in your pocket. I fall toward the latter camp. Daylite Touch is powerful and easy to use. As a $50 add-on to a Mac product that costs $190, it’s a welcome business ally. Daylite Touch is compatible with any iPhone or iPod touch running the iPhone 2.2.1 software update. It also requires Daylite 3.9 and Daylite Server 3.9.